The "R" (racing?) cage is on the left; "T" (touring?) on the right. The "T" cage has been unavailable for quite a while. But my shipment has arrived. Nitto R cage, 53 grams, stainless steel, $ 68.50 Plenty in stock. 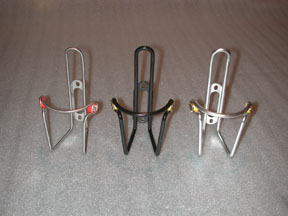 Nitto T cage, 55 grams, stainless steel, $ 70.00 Plenty in stock. For a lot less money, the Elite cages are tough, and the aluminum versions are easier on your water bottles than many other aluminum cages; not turning them dark grey wherever they touch. 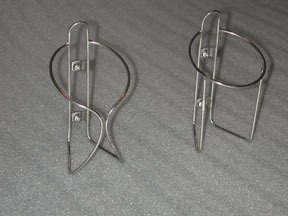 The stainless steel version is on the left. The other two are anodized aluminum.